Niho zenshin Niho Kotai Men Strike is the next step form Zenshin Kotai Shomen Strike. This is not very different from Zenshin Kotai Shomen Uchi. However, since this SEEMS easy to do because we just add another step forwards and backwards, we tend to practice this training with less concentration. 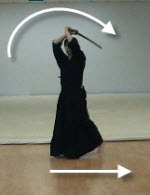 Footwork we use here is okuri-ashi, the basic footwork. And this part is the most important in this training, not striking. Niho Zenshin means "two steps forwards". Niho Kotai means "two steps backwards". This is how niho zenshin niho kotai shomen uchi is done. While lifting our sword up above our head, we take a step forwards onto the right foot. Just like we did in kyodo men. As you strike men, snap up the left foot forward. Make sure that the left foot does not pass the right foot or get too close to the right foot. Without going back to chudan (i.e. from the men position), lift our sword up above our head and take another step forwards onto the right foot. Now we are going backwards. While lifting our sword up above our head, take a step backwards onto the left foot. While striking men, snap the right foot backward. As lifting our sword up above our head and take another step backwards onto the left foot. We keep doing 1. to 8. until we hear "Yame!". Niho Zenshin Niho Kotai Shomen Uchi. Hajime! Repeat the count from 1 to 10 as many times as you want. Then, command "Yame!" 1. On each count, the practitioners strike two men. So they shout, "Men, men! " So it is done as shown below. As I mentioned earlier, we need to concentrate on footwork not striking. 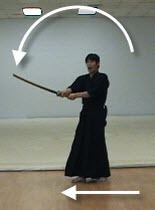 If we mess up our footwork here, it is harder for us to striking continuously. Our strikes will be faster and stronger as we practice more and longer. But if our footwork cannot catch up with the faster and stronger strikes, we just cannot keep striking. 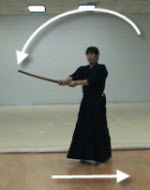 In the zenshin kotai shomen uchi section, I said it was important to pay attention to the sword-footwork coordination. 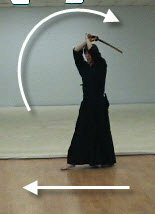 We should acquire the coordination in zenshin kotai shomen uchi so it makes niho zenshin niho kotai shomen uchi easier to learn. I say the same things as I said in zenshin kotai shomen uchi. No toes up while moving. When you go backward, make sure that the toes are not going to come up.